In case you don’t know of the SodaStream, it’s a killer countertop kitchen gadget that lets you carbonate your own water. One CO2 cylinder (refills for $15) will carbonate about 60 liters of water. (Read my full Sodastream Home Carbonator Review). When we first got the SodaStream, we tried their flavor syrups — and enjoyed them. That is, until we realized that they all have artificial sweeteners (if they used only sugar, it would require too much syrup). Instead, we’ve been experimenting with other home-grown flavors. I’m a fan of adding a dash of Fee Brothers Bitters (the original “Old Fashioned” variety), which have a refreshing cinnamon flavor (Note, nothing’s perfect: The bitters include food dyes). But take it one step further — say, a bit of Fee Brothers along with a dash of Almond Extract — and now we’re getting somewhere! 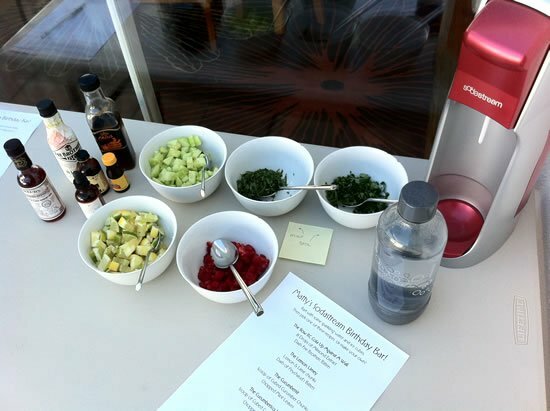 Have your own favorite Sodastream recipe? Please share in the comments! This is a product I personally use and enjoy, and think you will too. If you click on the affiliate links in this post and then make a purchase from Sodastream, I’ll earn a small commission. Thanks for your support! Oooh I am loving your ideas! I also am not a fan of the artificially sweetened syrups. I like to make tea concentrates and use that instead. I will have to try your ideas now too. Thanks! Tea concentrates? Tell me more, please! What a great idea! I was interested in SodaStream until I saw that their syrups all use Splenda (I am mildly allergic to it, to some forms more than others). I didn’t realize you could flavor it yourself! Let us know what you flavors you come up with, eh? I was just told by a coworker that Soda stream is introducing a naturals line in May… hmmm would love to try it or hear reviews! Interesting… I just took a look at the labels of those. They may be “natural,” (which is a meaningless word) but they still have a lot of sugar! As prepared (with one ounce of syrup and eight ounces of seltzer), it’ll be 24g of sugar. The same size serving of Coke has 26g of sugar. (A 12-ounce can of coke has 39g). Yeah…. I don’t drink real soda but at least it’s not HFCS? I love your drink ideas! Since October unprocessed I don’t drink diet coke anymore! I have been drinking carbonated or “fizzy” water. From a healthy point of view Is carbonated water ok? Well what ELSE would you add?? I mean! I disagree with keeping spirits in the freezer. They don’t melt ice cubes enough in the shaker if you do that and then you end up with a too-strong beverage that lacks subtlety. OK, if you’re mixing with fizzy water this is not so important.